In interior as well as in literature you need to know how to interpret and to read in between the lines. E-interjeras blog offers you a lot of different ideas, only one thing – they’re usually indirect…you just need to observe closely to the picture and you’ll immediately find a lot of different ideas! Why didn’t I write down the whole fiction out of my insights? I simply don’t have time and the second reason is that I want you yourself to analyze the examples, I don’t believe that you won’t find anything that will fit at your home. My intuition whispers that some people don’t understand until now how it’s possible to find something for their interior even though their financial capabilities and quadrature don’t let that. I’m saying that it’s possible! 1. A topic "Homestead interior"
I’m trying to imagine what you think: “A bedroom and that’s it, a pretty good pillowcase and those boards would look perfect at homestead” and everything’s done with it. How the curtain hidden in the ceiling look like. I have no doubts that after exploring these solutions, a suitable alternative will appear at your head and as soon as you need a suitable solution or you wish any changes at home, you’ll already know what solutions there can be. 2. A topic "Tabaco hotel interior"
“What could I find here that could be suitable for me? Probably everything was projected by designers here and everything costs so much…” Well, and what’s the problem that it’s a hotel? You have a perfect example of the bathroom after analyzing which you’ll see something that probably doesn’t give you peace. For example, you can’t come up with what kind of tiles to use. 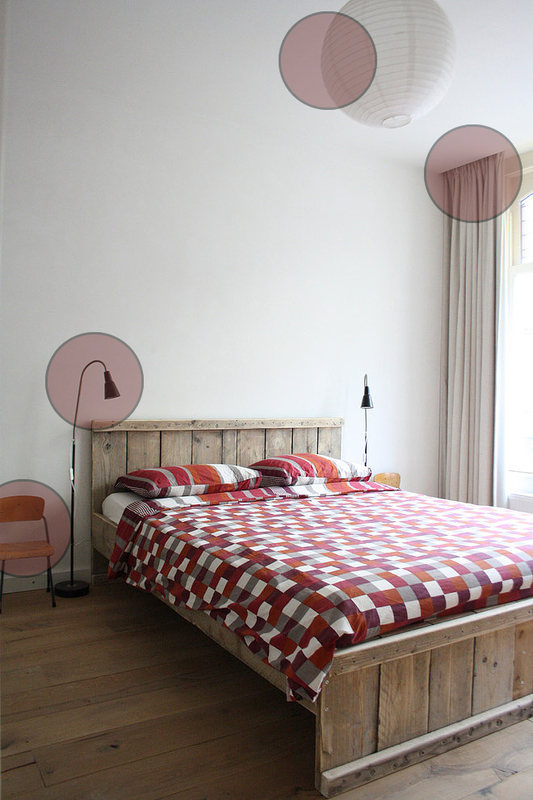 Here you see the example how the big-format-tiles and even the same colors on the floor look like. I even see the solution how to provide the room with the focus incorporating the tiles of different format or colors, in this case, framing a toilet bowl and introducing those tiles to the shower zone. 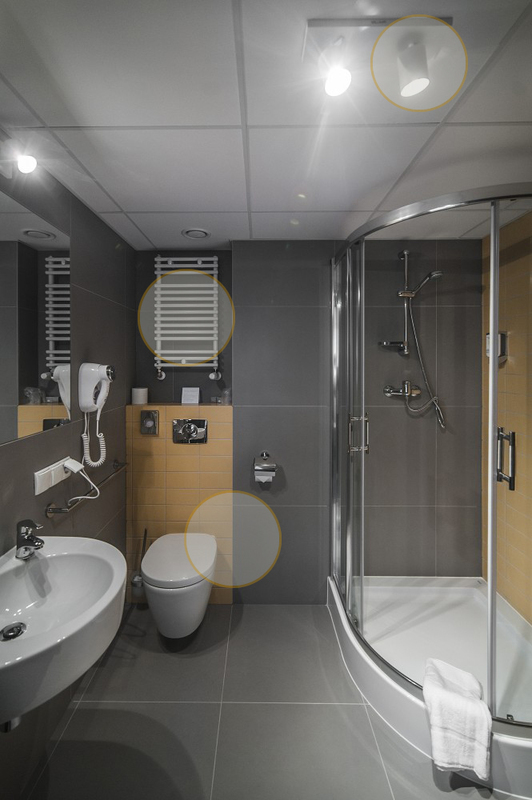 Just look how perfectly the junctures of the small and big bricks correspond – I have no doubts that if you only count and search for a while you can definitely match different tiles in a bathroom. The next solution is a towel dryer over a niche which is over a toilet bowl. It seems that not for everyone it’d be comfortable to hang a towel there, however, just look and you’ll see that the ceiling there is indeed not high – in the best case 2.20 m, as the height of a shower is only by 10 centimeters lower than the ceiling. As soon as notice such a nuance, it becomes not so strange why the towel dryer is so high and then I understand that I’d reach everything, too – well, I even reach door jamb :) Of course, such a solution is possible when there’s the lack of space and maybe you have the same problem. Well, and one more aspect is lighting. A non-standard and contemporary solution instead of halogen or a round ceiling lighting in the middle of the room. 3. A topic "Penthouse apartment interior"
Well, yes, there’s an APARTMENT and huge expenditure is made here and there’s also a lot of space but what have I seen here? Well, the best solution to a small bathroom! 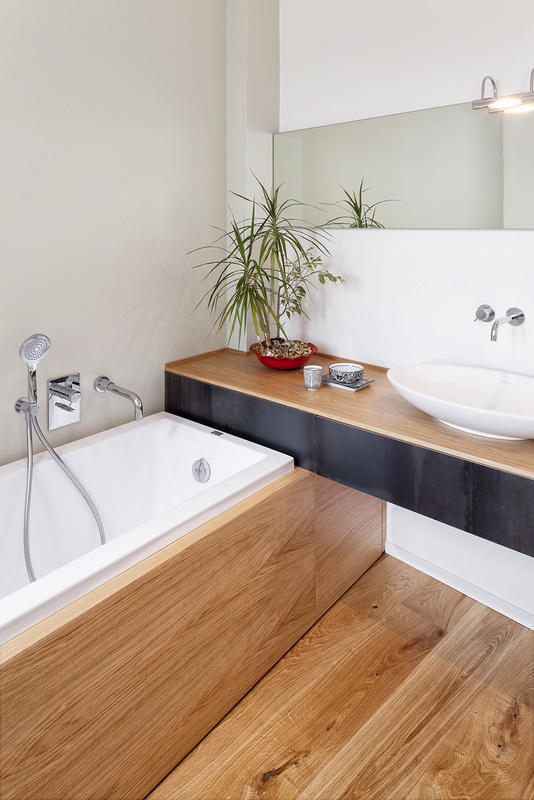 The wooden décor looks indeed cozy (protected from water), what a nice idea it is to expand a washbasin worktop over a bath and to create the space for bathroom accessories and, if needed, even to put some handles! 4. A topic "Kitchen design black-white"
The given topic is about colors but as soon as I take a look at the kitchen, I see other views. 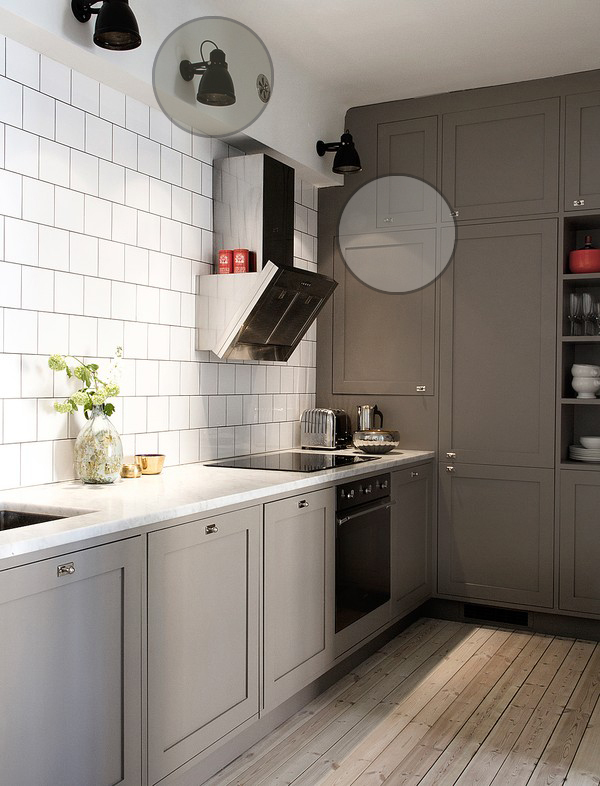 For example, do you notice how wisely each corner for the high cabinets is used? A very interesting solution for lighting, too – a ‘beam’ slightly distracted from the wall which the wall illuminators are installed on. Well, a really good idea and applicable in a usual interior even if the ceiling is not suspended and there’re no hanging cabinets. Well, and you can also look how grey furniture, white walls and wooden floor fit, maybe that the combination you’re thinking of? I hope that I helped and now on E-interjeras blog you’ll see not only what’s written in a heading and will take a more closer and thorough look from another side. Don’t devaluate yourself – you can also find very interesting solutions and apply them to yourself!